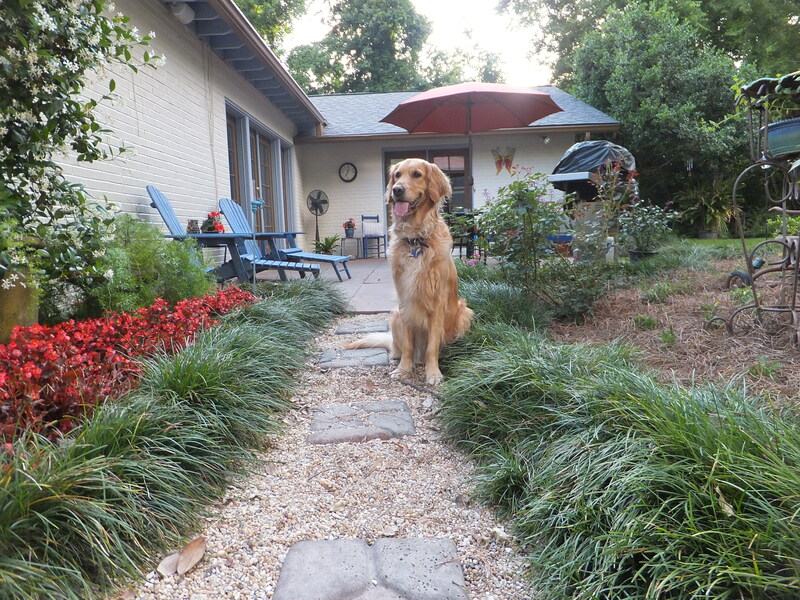 My humans spent nearly every second of their Memorial Day weekend getting my garden ready for summer. At first, I was a little unhappy that so much of the focus for the weekend was on gardening and not on me. Then on Monday evening I got a look at everything my humans had accomplished . . . and I decided that I simply must take you on a tour of my garden. 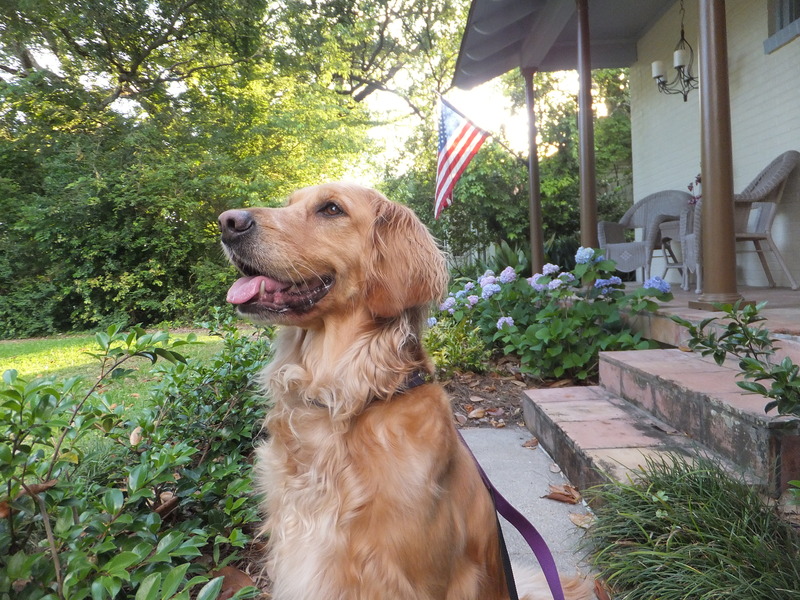 My humans have two flags: their Louisiana State University flag and their United States of America flag. Every Memorial Day weekend the American flag goes up and stays up until the first LSU football game in fall, when the LSU flag goes up. 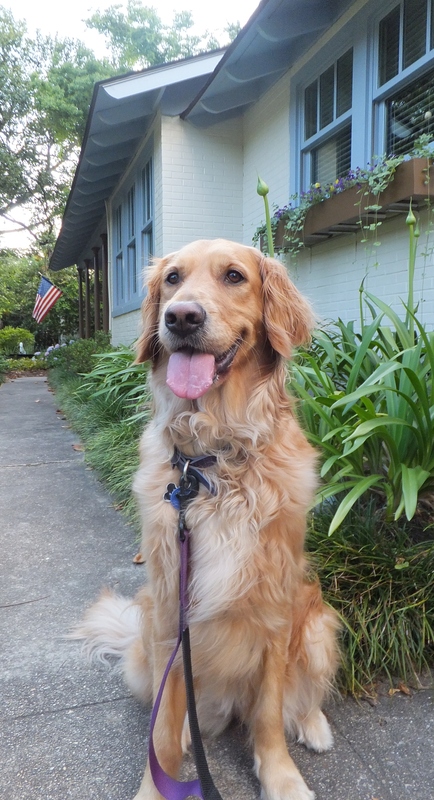 I really enjoy spending time with my humans on our front porch, and I am super excited about our blue hydrangeas. The hydrangeas on the other side of our yard are mostly very pink.. It’s hard to believe that the soil can be so different from one side of the yard to the other. The coral vine in our front yard was full of blooms and very popular with the hummingbirds this spring. It was surrounded by white petunias, but the early summer heat has been a bit rough on the petunias (it’s been a bit rough on me from time to time), so my mommy pulled them up and planted blue daze. The new little plants are hard to see here, but in no time they should fill this space with pretty blue flowers. I’m also looking forward to seeing these agapanthus blooms open. Today, my humans and I counted 21 blossoms, and I’m sure more will make an appearance shortly. You may remember this front bed from one of my Wordless Wednesday posts in early April. At that time, it was filled with pansies and snapdragons. It’s gotten a little too warm for those pretty flowers, so my mommy pulled them out and planted yellow marigolds and blue salvia. They’ll both handle our summer heat. I didn’t get to help my humans very much while they worked on getting the front garden into summer shape–it was just too hard for them to work and watch me–but I did get to offer my assistance as they worked on my back garden. After all, the back yard is my yard, so it’s only fitting that I should have a paw in its seasonal preparations. My mommy transplanted the begonias on the left from the bed on the right. Believe it or not, they actually made it through the winter. It looked like a late freeze had taken them out, but they managed to come back. Transplanting the begonias left a blank canvas in the big bed, so my mommy planted some false heather and the leftover marigolds from the front bed planting. You can’t really see them now because they’re still little, but you can see my mommy’s tricycle from when she was about my age. It used to be hidden in another part of the yard, but my mommy decided to move it front and center to this spot. She’s still trying to figure out how to get a flowerpot to sit securely on the seat. Our garden tour will conclude in the back corner of my yard. I love sitting back here and chewing on sticks. This is also a prime squirrel-watching location. My mommy painted these chairs a couple of weeks ago. They used to be green. 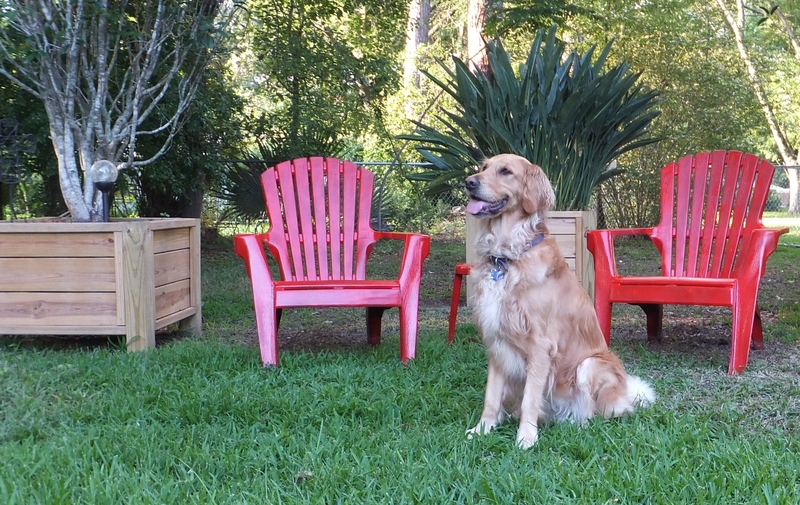 That’s also when she painted the blue chairs on my patio. They used to be plain-old-wood color. My mommy loves to spray paint things. When I see her with one of those cans in her hand, I try to stay out of the way. I don’t want to become a Turquoise Retriever! I hope you’ve enjoyed your tour of my garden. Now that all of the summer preparation is complete, my humans and I are looking forward to many hours of fun and relaxation. Thank you. Hanging out in my garden is one of my favorite things to do. And I have dog friends who live on either side of me so I get to visit a lot, too! Thanks for the tour. You really do have a wonderful garden there. Thank you for the tour. It looks like you have great places to hang out. Thank you. My humans worked really, really hard. They can’t stop moaning and groaning about all of their achy muscles. 😉 But now comes the fun part–enjoying it! 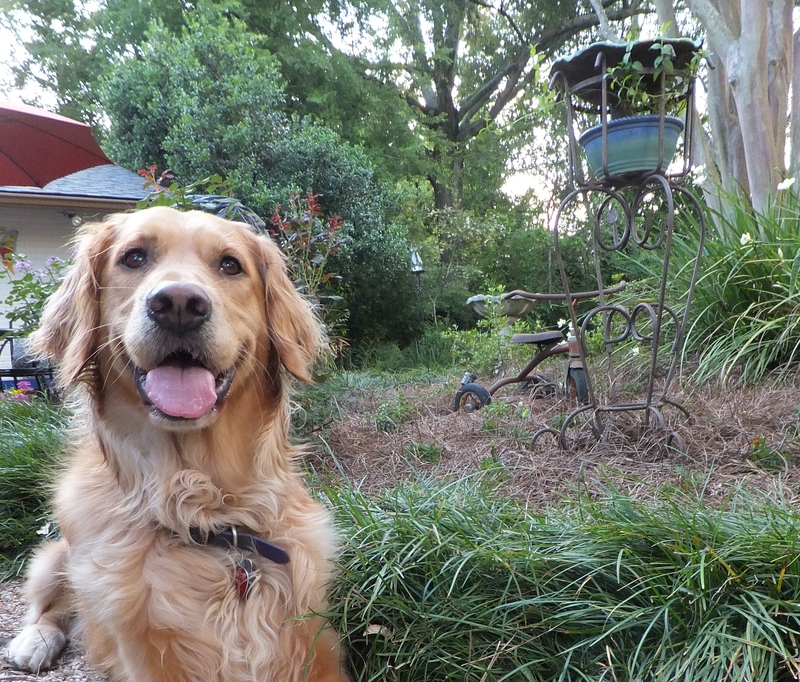 Oh Miss Harper Lee, aren’t you the Top Dawg with your beautiful home and lovely garden??!! Yellow marigolds and blue salvia are the favorites of the old woman Slow so you put a smile on her face first thing this a.m. all the way out in SC! You always put a smile on The Red Man’s face whether you’re in the colorful fabulous garden pictures or black and white Sundays. I hope you encouraged your humans to relax with a refreshing adult beverage when they were finished in the garden. I see the Gamecocks are hosting regionals here in Columbia this weekend. I must check out who we will be playing…surely not LSU? What a beautiful yard you have! Gotta check out the begonias cos we mostly do perennials. my roses and daylilies are blooming. The fenced backyard is where Kirby helps out. Like you he rarely gets to be in the front yard cos I worry about the cars on the street. Great work this weekend! Now relax and enjoy! I plan on getting into serious relax and enjoy mode! I’ll bet your roses and daylilies are beautiful. For some reason my mommy doesn’t have luck with daylilies, but she really loves seeing them all over our neighborhood when we walk. 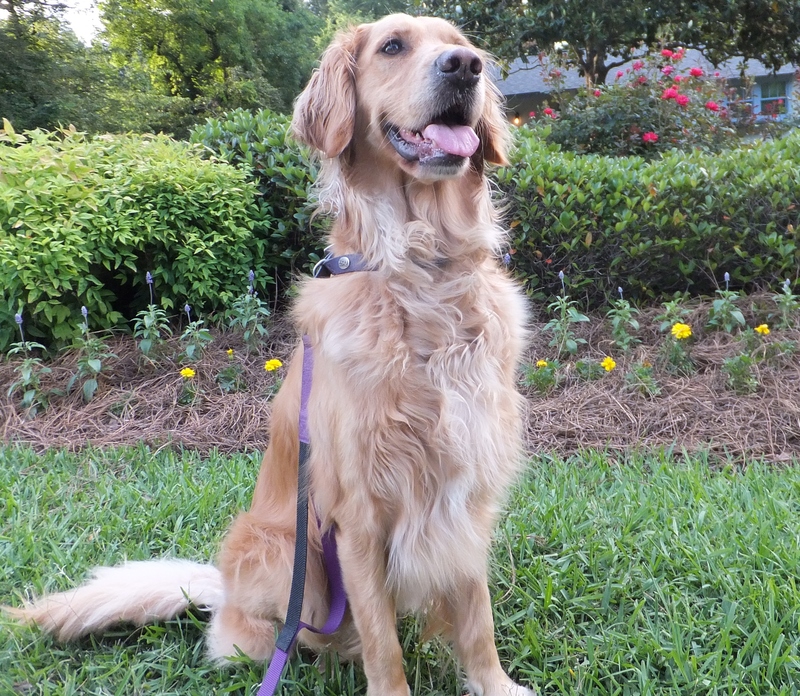 What a lovely garden Miss Harper Lee and it looks grrreat for zoomies and other running games. We hope you and the hoomans have a very happy summer in your garden. That is a beautiful tour of a beautiful place. I like your red chairs also! And I can absolutely tell it is a prime squirrel watching location! Thank you very much. Wouldn’t it be so much fun if every single blog dog could come over and play? p.s. I featured you in my Haiku yesterday for the Daily Prompt. I hope you like it! Woooowoooooo! Beautiful flowers and landscaping! I wish your mommy would come and fix my back yard. Thanks so much for the tour, Harper! So enjoy your posts. your garden is wonderful 🙂 and you’re such a pretty puppy! Thank you very much. I’m looking forward to watching all the little plants grow. The only thing more beautiful than those gardens is Miss Harper Lee sitting in those gardens! 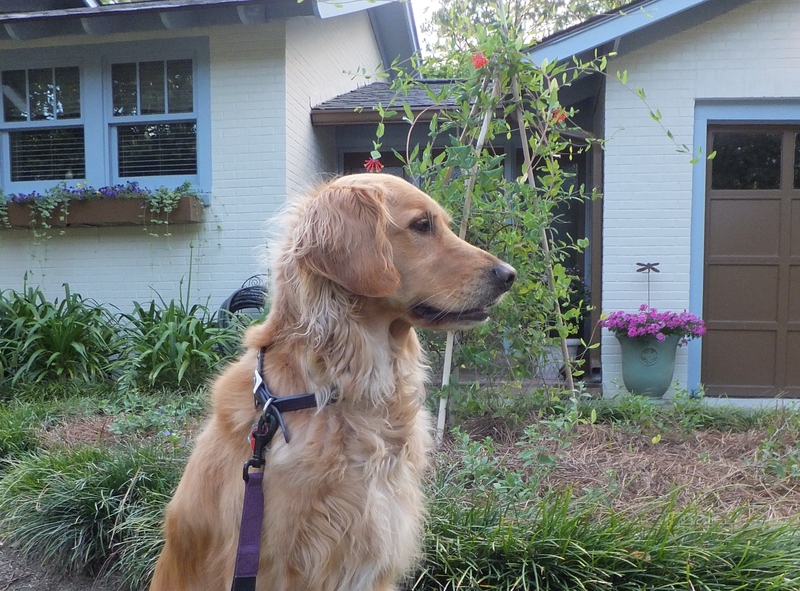 Thank you for the tour….I love gardening and love to see what other people’s yards look like. We are way behind you up here in the North but soon I’ll be able to put some marigolds and other flowers out too! Where my humans used to live, there was a Backyard Garden Tour. It was so much fun because you never knew what beauty waited behind each gate. I hope you can get out in your garden soon. Down here we have to rush to get the garden in shape before it’s too hot to work outside! Beautiful! I love the chairs too. My mom also taught me the joy of spray painting furniture. Such a great idea! Miss Harper – your garden is beautiful. SlimDoggy might want to come courting and sit in that garden with you someday. He particularly would like the back area with the squirrels. Golden Thanks! LOVE the tour and you have a beautiful garden. Can’t wait for an update to see many more blooms. Golden Woofs! Thank you very much. 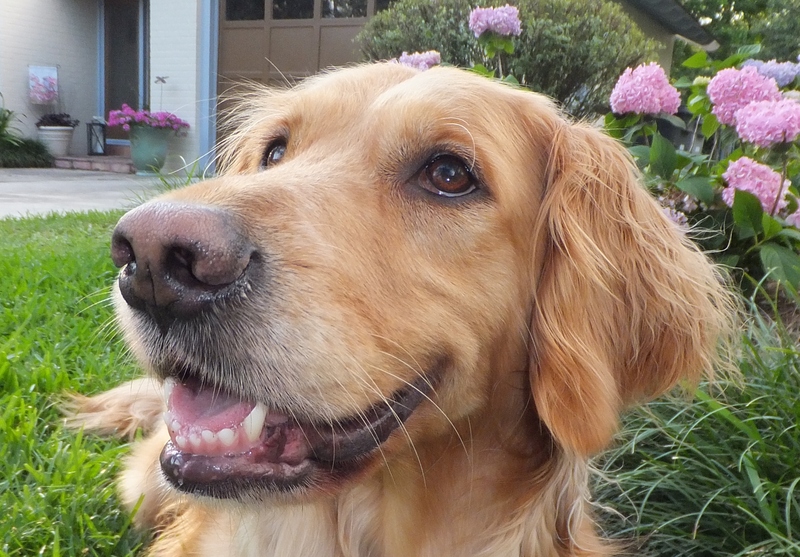 I’ve been a garden girl working right by my mommy’s side since I was a tiny puppy! What a lovely tour, you live at such a beautiful place. That is so sweet of you to say. Lately it’s been a real struggle to keep things alive because we haven’t had rain and its been kind of extra hot. But so far today we’ve had over an inch of rain. Our little dance yesterday worked!